Wash and place the rice into the rice cooker . Add the screwpine and tumeric leaf , oil , water . Cook .Discard the leaves and cool the rice . Rub some tumeric powder and salt to the fish . Then either grill ir or deep fry it and flake the fish after removing the skin and the bones . 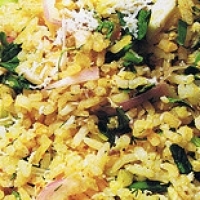 Serve the rice in a serving bowl mixed with rest of the ingredients .